Feel the summer breeze with Futulele, the only digital Ukulele you'll ever need! It looks amazing (Retina graphics), sounds awesome, offers fully automatic play modes, great interface and even can be extended via the optional Futulele Remote app. Absolutely suitable for ukulele novices, but brings a lot of fun even to experienced ukulele players! 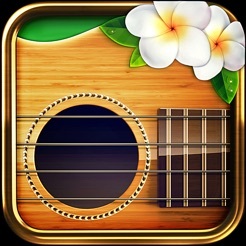 This is the ukulele app that can be seen on Apple's advertising materials for iPad & iPad Mini! + Futulele is now UNIVERSAL, with separate versions for iPhone and iPad. + Also seen on NBC, Mashable, BoingBoing, Engadget, Gizmodo and many other news sources! Futulele is simply the best-sounding Uke synthesizer in the world. The CrystalClear 4.0 sound engine works with 72 highest-quality Ukulele string samples, combining and tweaking them on the fly to deliver fantastic Ukulele experience. 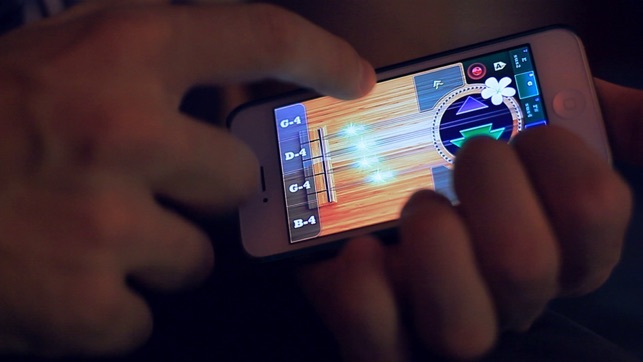 Futulele detects your strumming speed and alters the sound accordignly. The engine is also capable of detecting the current output mode (speaker/headphones) and making the ukulele instument sound perfect under every occassion. If that was not enough, there are 4 customizable FX: Grand Stereo Reverb, 3-Band EQ, Lush Chorus, Tape Delay. 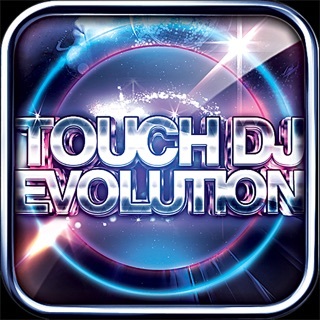 Fully automatic playing is possible, just hold the Automatic button and enjoy the results! 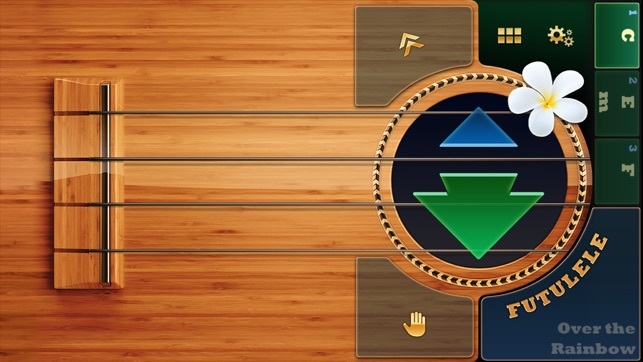 There are 15 strumming patterns available, which can be changed in the Options menu. Recording is a blast and takes only one tap. Futulele records to .WAV which can later be converted to .M4A via the built-in File Manager and found in the iTunes File Sharing. 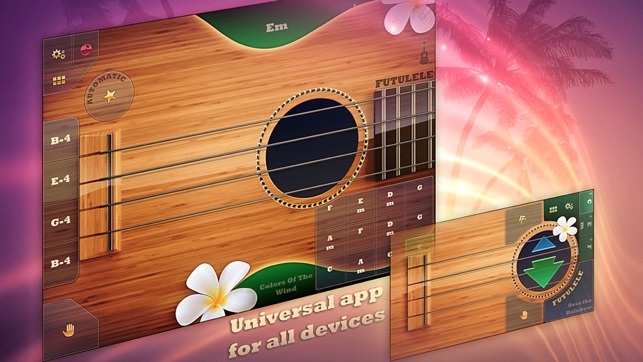 Futulele comes with 10 pre-defined ukulele songs, and you can easily create an infinite number of your own. Up to 12 chords can be used per chord set. There are 132 possible chords in total, more than enough for any ukelele song! One of the most remarkable features of this digital Uke is that it can be operated with the iPhone (iPod Touch) and the iPad simultaneously, in a way that has never been introduced before. 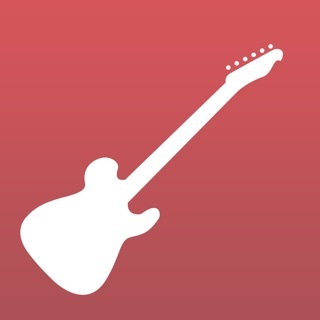 On the iPhone, you'll need to install Futulele Remote app (available separately). It is not a secret that many iPad owners also have an iPhone, so Futulele is an excellent and innovative reason to get the best musical juices flowing out of both. A special guitar-shaped case holds the two devices, making it possible to select the chord on the iPhone and strum along the iPad screen, just as on a regular ukulele. Changing a chord requires only one tap, and the strumming technique is easy and convenient. No external wires or hardware accessories are needed, since the devices use Bluetooth or Wi-Fi (selected automatically) for communicating. + Very easy to play! No music background needed! + Strings respond to the speed of strumming! + Can be extended via separate Futulele Remote app for iPhone/iPod Touch. Make your own cyber-ukulele! Preserve battery life when in background. Direct access to AutoStrum for iPhone. 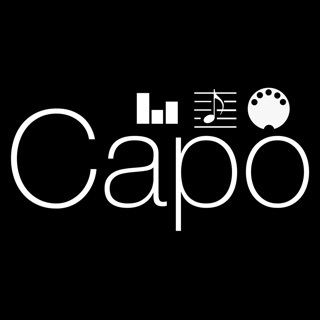 Protect crashing on Ukulele instrument change. Sound improvement for iPhone 6s and higher when playing via speakers. I can't believe how awesome this app is and at only 99 cents. The remote app synced perfectly to the iPad. The sound is amazing, the chords are preset, there are preset songs, this is amazing. App can’t output audio to Bluetooth. I can’t get this app to output audio to my Bluetooth headset. All other apps output audio to my Bluetooth headset.